Lane Johnson will be an Eagle for the foreseeable future. Bud Light made new friends with thousands of Philadelphians last month when it made good on its promise to give free beer to fans if the Philadelphia Eagles won the Super Bowl. 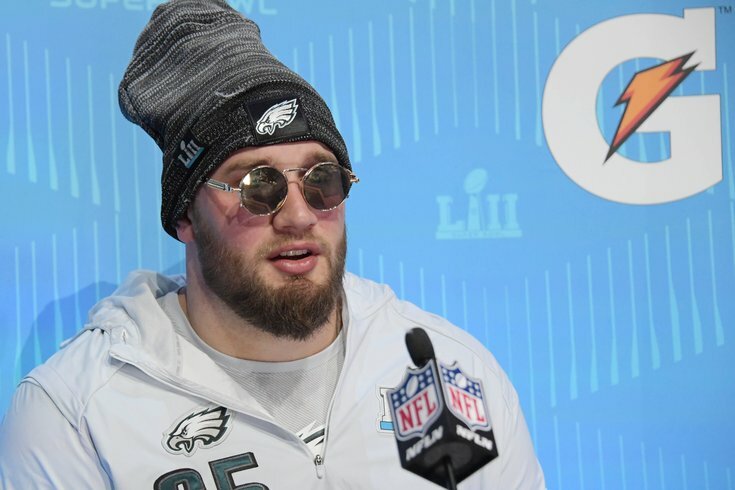 For those in need of a refresher, the brand first made the pledge after Eagles offensive tackle Lane Johnson promised "beer for everybody" in August if the Eagles won it all in the 2017 season. And although it's possible that Bud Light was merely mocking the Eagles' then-long odds at capturing their first Super Bowl title last season, the brand partnered with dozens of bars to serve up thousands of free Bud Light cans along the victory parade route on Feb. 8. As if that wasn't enough, Bud Light did it again this week, albeit on a somewhat smaller scale. The brand apparently delivered a stack of free Bud Light cases to Johnson's doorstep Saturday morning – a thank you gift to the 27-year-old for saving the Eagles $7.5 million in cap space when they restructured his contract earlier this week. Johnson took to Twitter on Saturday morning to post pictures of the package – a pyramid of over a dozen Bud Light cases complete with a message written on a medieval scroll, a nod to the company's "Dilly Dilly" commercials. "Woke up to this. Thanks @budlight! Johnson tweeted. Johnson said some of the brews will go to Eagles defensive end Chris Long, who could no doubt use a few after top-seeded University of Virginia – Long's alma mater – lost in a historic upset to 16th-seeded University of Maryland-Baltimore County in the first round of the NCAA men's basketball tournament on Friday night. The rest is for the neighborhood, he said. Johnson has proven himself "a true friend of the crown in obtaining beer for your city following your Super Bowl victory," Bud Light wrote to him. "However, your latest gesture in restructuring your contract of the good of the Eagles of Philadelphia makes you an even truer friend of the crown." As the brand acknowledges, Johnson didn't take a dock in pay when the Eagles converted a large chunk of his 2018 salary into a signing bonus that they will spread over the remainder of his contract. But the move was one of several that allowed the Eagles to give a contract extension to linebacker Nigel Bradham, sign linebacker Corey Nelson and add veteran Haloti Ngata to an already potent defensive line. For that, Lane, Bud Light thanks you. "We know it wasn't exactly a pay cut, but anyone who makes a sacrifice to help out his team is a friend you can count on and for that we wanted to reward you a few beers to share with your Eagles brethren," the letter stated. "Dilly Dilly!" The surprise move was also bound to please Eagles fans on Twitter, some of whom asked Johnson to send a few of the beers their way. Hey Lane! Mind sending some our way?! Send some this way big guy!